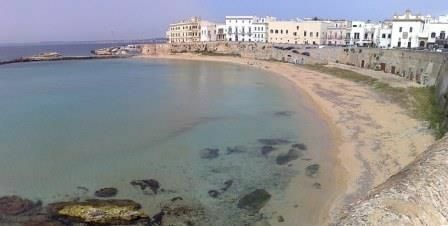 If you are a couple, or a family, or a group of four people, willing to spend a lovely vacation in Gallipoli, the most famous and attractive city in the Salento area, the home we rent is the one you are looking for with the best quality/price ratio. The large rental house, is located on the ground floor of the historical D’Ospina Palace, two minutes walk from the most beautiful beach in the town (Purità beach), the famous yellow sand beach right in the middle of Gallipoli’s Cittá Vecchia, an island settlement connected to the mainland by a bridge. The recently restored house is a fully furnished, one bedroom apartment with a queen size double bed, a single bed, a living room with a convertible couch, separate kitchen, bathroom, all inclusive, air conditioning and a cool and shaded patio perfect for breakfast and dinner. 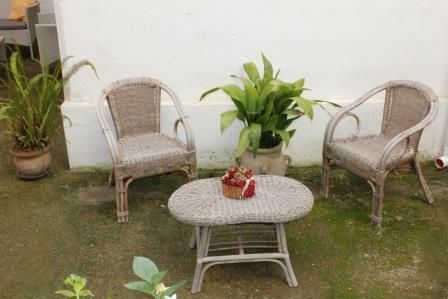 The backyard is a safe and nice place for children to play in and where small pets can also enjoy their stay. 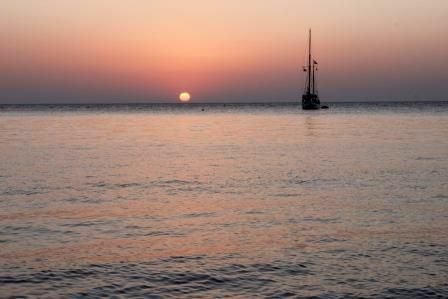 Our house is the ideal choice for a family, a couple, or a small group of friends who want to enjoy the convenience of having the sea at their doorstep next to an airy, comfortable and functional house. Just on your doorstep, you can tour one of the biggest underground oil mills in Gallipoli, located within the same building and dating back to the XVI century. Angioino Castle is also very close to home. After a tour in the old town, you can enjoy the happy hour time, while experiencing the famous Gallipoli sunset,from one of the fancy bars located along the ancient walls, dive into the nightlife of Gallipoli, or cook yourself a fresh fish barbeque at home! By car: take the SS101 from Lecce and exit at Gallipoli. 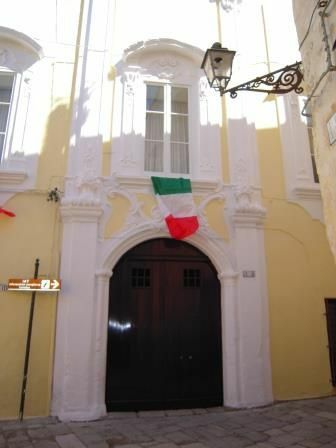 The house is in Via Sant'Angelo 16, in a restricted area. Public paking is a 5 minute walk. By plane; Brindisi airport is the nearest to Gallipoli city. Once landed in Brindisi, take a shuttle to Gallipoli (private service). By train: from Lecce station, take the Ferrovie sud Est train to Gallipoli. Gallipoli train station is about 1,5 km from the house. Nothing short of wonderful apartment that has even exceeded my aspettative.Innanzitutto to the position where it is located: Stepping out the door of the building (a beautiful old building and historic) you are already in the heart of the historic center of Gallipoli (despite it inside the house does not receive any external noise), near the house there are plenty of grocery stores and fruit and vegetables, as well as many souvenir shops, restaurants, beautiful churches, but above all .... 50 meters it can 'say ..the beautiful beach of Purity with its enchanting sea. 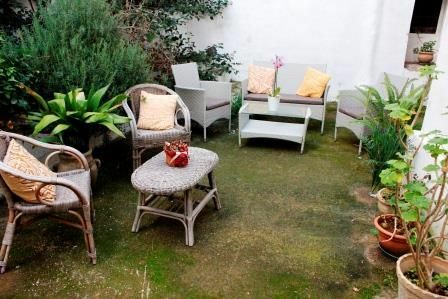 Besides the strategic location of this charming apartment on the ground floor, inside there are all comforts, from air washers conditioning.All bathroom very nice shower and a very comfortable, but the highlight of the house is a small courtyard. ..giardinetto you can make for lunch or just relaxing. 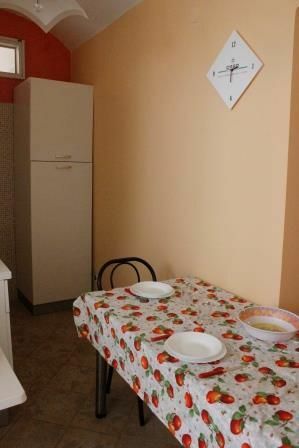 The rooms are very large, the brand new kitchen and full of all the necessary utensils. I stayed as a couple and I can guarantee that for a couple this apartment is the best .... It 'was sad to leave andI can not wait to go back! The owner a very nice person and very serious. Highly recommended! Appartamento a dir poco meraviglioso che ha persino superato le mie aspettative.Innanzitutto per la posizione in cui è collocato: Mettendo piede fuori al portone del palazzo ( un bellissimo palazzo antico e storico) ci si trova già nel cuore del centro storico di Gallipoli (nonostante ciò all'interno della casa non si percepisce alcun rumore esterno), in prossimità della casa ci sono tantissimi negozi di alimentari e di frutta e verdura ,oltre che tantissimi negozi di souvenir, ristorantini,bellissime chiese,ma soprattutto....a 50 metri si può' dire ..la bellissima spiaggia della Purità con il suo incantevole mare. 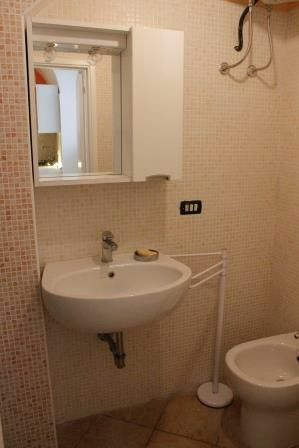 Oltre la posizione strategica di questo graziosissimo appartamento a pian terreno,al suo interno sono presenti tutti i confort ,dalla lavatrice all'aria condizionata.Un bagno molto grazioso e una doccia molto comoda,ma il pezzo forte della casa è il piccolo cortile interno...giardinetto da poter sfruttare per pranzare o semplicemente per rilassarsi. Le camere sono molto ampie,la cucina nuovissima e piena di tutti gli utensili necessari. 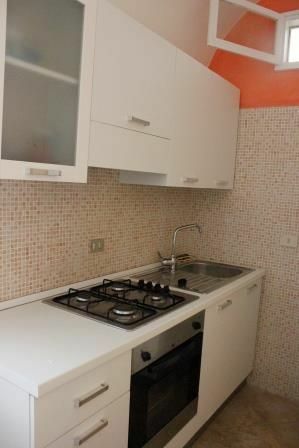 Io ho soggiornato in coppia e posso garantire che per una coppia quest'appartamento è il massimo....E' stato triste doverlo lasciare e non vedo l'ora di ritornarci! Il proprietario una persona squisita e molto seria. Consigliatissimo! 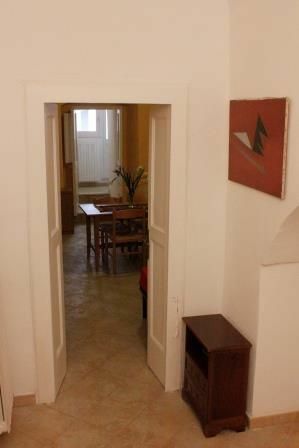 The house is located exactly in the center of Gallipoli "old ", an easy walk from the parking of the port. Spartan, but spacious and equipped with all amenities, with spacious courtyard. Owner very polite and friendly. Holiday home absolutely recommend. La casa si trova esattamente nel centro della Gallipoli "vecchia", facilmente raggiungibile a piedi dal parcheggio gratuito del porto. Spartana, ma spaziosa e dotata di tutte le comodità, con ampio cortile interno. Proprietario molto gentile e cordiale. Casa vacanze assolutamente da raccomandare. Very cozy and comfortable, being in the center of Gallipoli. Owner very helpful. Highly recommended !!! Casa molto accogliente e comoda, essendo nel centro storico di Gallipoli. Proprietario molto disponibile. Consigliatissimo!!! Thanks to the benevolent judgment ... I am pleased that you have been enjoyed and hope to welcome you again ... enjoy the rest of the season and good recovery! " Grazie per il benevolo giudizio... sono lieto che vi siate trovati bene e spero di potervi ospitare nuovamente... buon proseguimento di stagione e buona ripresa!" The comforts of home in a dream location! Directly in the center of Gallipoli and near the sea. It features all the comforts (air conditioner, washing machine, wifi, own garden) recently renovated, very large and spacious. Mr. Claudio a very kind and helpful to any request. We were also very pleased beyond our expectations and we'll definitely return. Highly recommended for a dream vacation. 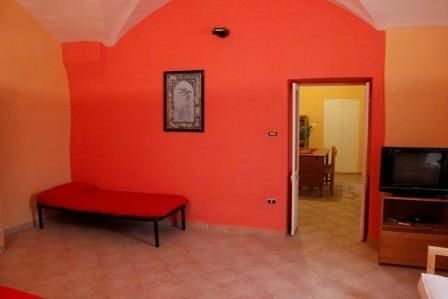 La comodità di casa propria in una location da sogno! 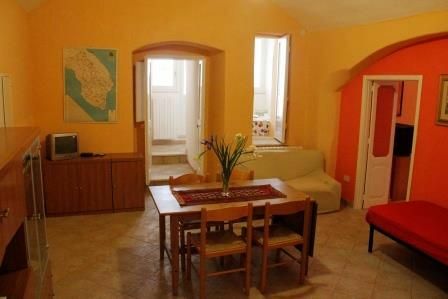 L'appartamento è inserito in un bellissimo palazzo Direttamente nel centro storico di Gallipoli e a due passi dal mare. È dotato di tutti i confort (condizionatore, lavatrice, wifi, proprio giardino interno) recentemente ristrutturato, molto ampio e spazioso. Il Signor Claudio una persona molto gentile e disponibile a qualunque richiesta. Siamo stati molto soddisfatti anche al di sopra delle nostre aspettative e ci torneremo senz'altro. Consigliatissimo per una vacanza da sogno. Thanks to the benevolent judgment ... I am pleased that you have been enjoyed and hope to welcome you again ... enjoy the rest of vacation and good summer! Grazie per il benevolo giudizio... sono lieto che vi siate trovati bene e spero di potervi ospitare nuovamente... buon proseguimento di vacanze e buona estate! Beautiful home, very comfortable and studied in every detail. Very close to the beach within walking distance of Purity in three minutes. Palace charming and well maintained, very easy because it was added in the historic center of Gallipoli. Owner friendly and available for any request. 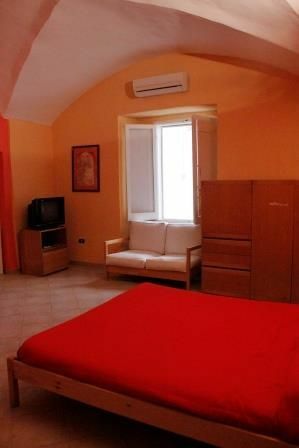 Casa bellissima, comodissima e studiata in ogni particolare. Vicinissima alla spiaggia della Purità raggiungibile a piedi in tre minuti. Palazzo suggestivo e ben tenuto, comodissimo perchè inserito nel centro storico di Gallipoli. Proprietario gentilissimo e disponibile per qualunque richiesta. Rates are for two (2) people per week. 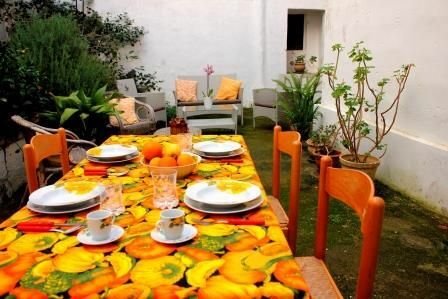 In case of a larger number of guests, up to five (5) people, the price can be direclty agreed with the landlord. The additional beds for children (up to two years old) are free. Timing and frequence of cleaning (additional service) will be agreed with guests. 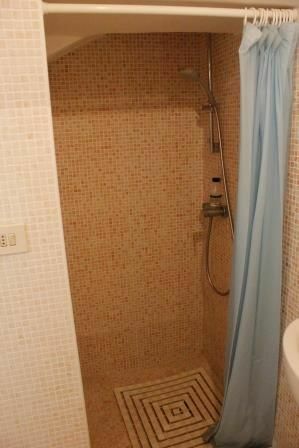 Bath and bed linen can be rented at an additional fee of 10 euros per person per week. 200 euros deposit is requested on check-in and will be refunded at check-out.